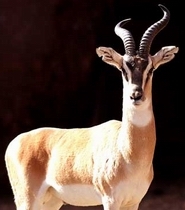 This gazelle was named in honor of a great German physician upon his 50th anniversary of obtaining the medical degree. Cretzschmar (1826) depicted that animal as being quite dark brown. In the review of "Nanger" gazelles, however, Lange (1971) described the animal as having a light-colored back. Moreover, he suggested that a number of subspecies exist, largely differentiated by horn types. He reviewed skulls and living specimens of this species and compared them with Dama and Grant gazelles. Soemmerring's gazelle is the smallest of these species and is one of the "Nanger" (naguer) gazelles, or "Spiegelgazellen" (because of the white rear patch. The denominated specimen was said to have originated in Somalia . Most or at least many animals now kept in zoos come from Khartoum , but who it is that makes the decision for the denomination "Soemmerring" of any given animal is unknown. This is even more dubious when their chromosomes and varied phenotypes are studied. It would appear that there is a mixture of these animals in captivity and few if any are truly Soemmerring's gazelles as originally described. This hybridization of related species with, however, different chromosome numbers, is perhaps also the reason for their frequently poor reproductive performance in captivity. Soemmerring's gazelles migrate annually in the Sudan , relocating to areas with more food and water. Males are territorial, though this may be on a temporary basis. Defended ranges are staked out via dung middens, while the small-slitted preorbital glands do not seem to play a role in marking. When confronting rival males, Soemmerring's gazelles flick their heads, and when fights arise they yank their hooked horns sideways in an attempt to make the opponent lose his balance. When herding females, males make a nasal croak. During the courting of a receptive female, the male drives her at a walking pace with his head raised. Instead of the typical gazelle foreleg kick, the male does a stiff-legged "trot in place". Copulation occurs while walking, with both partners keeping their heads up and the male trailing after the female on two legs. Habitat: Grassy plains or light bush, it drinks regularly when water is available. Food consists of mainly grass. The species favours rough, hilly country with scattered evergreen thickets and Acacia/Commiphora steppe, as well as, open, short grass plains (Kingdon, 1997; East 1988; Spinage, 1986).